Vellum can import any file with a .docx extension. These kinds of files are often created by Microsoft Word, but other word processing applications can create them as well, including Scrivener and Pages. Because it is so quick to see the results of an import, we recommend jumping in and importing your manuscript. Often, that’s all you will need to do. This page includes more details about the importing process, as well as some solutions for commonly-encountered issues. Press Import Word File… to bring up the Open Panel, which allows you to select a .docx file to import. Vellum will open the chosen document, analyze it to find title information and chapters, and then convert it into Vellum’s native format. 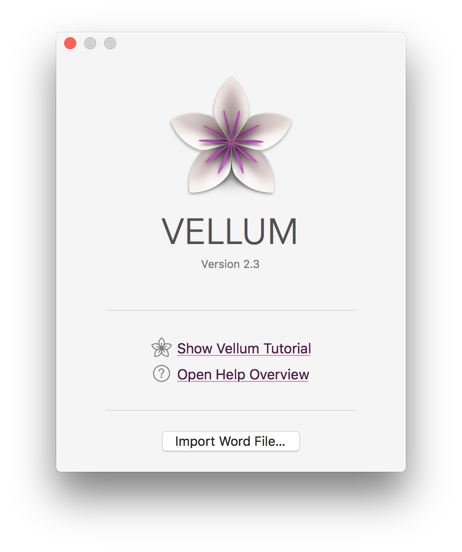 You can also import .docx files directly from Vellum’s File menu, or by dropping it onto the Vellum flower icon in your dock. Because there is no official way to indicate the beginning of a new chapter in a .docx file, Vellum analyzes its content to detect chapter breaks, and other formatting. To indicate a new chapter, we recommend using a Page Break followed by a centered and bold chapter number (e.g. Chapter 1). If you have a chapter title, that should also be centered and bold. Vellum also looks for centered and bold element titles for non-chapter elements, like Prologue or Acknowledgments. Individual blank lines will be treated as Scene Breaks in Vellum. When Vellum finds three or more blank lines in a row, it will interpret that as a chapter break. Avoid using blank lines in your manuscript solely to position text on the page. Since Vellum creates a Title Page and Table of Contents automatically, we recommend removing those elements from your manuscript before importing. Vellum will import your manuscript’s title and author from the information you specify in its properties. You can set these values in Word by using its File ▸ Properties… dialog. If you prefer, however, you can specify this information in Vellum’s Title Info pane. Scene breaks indicated by symbols in your manuscript will be imported as Ornamental Breaks. If you are having trouble, we recommend using three asterisks (i.e. ***) on their own line in your .docx file. Sometimes importing your manuscript doesn’t result in the elements that you expect in Vellum. While following the best practices will often address these issues, it may be easier to clean up your import using Vellum. 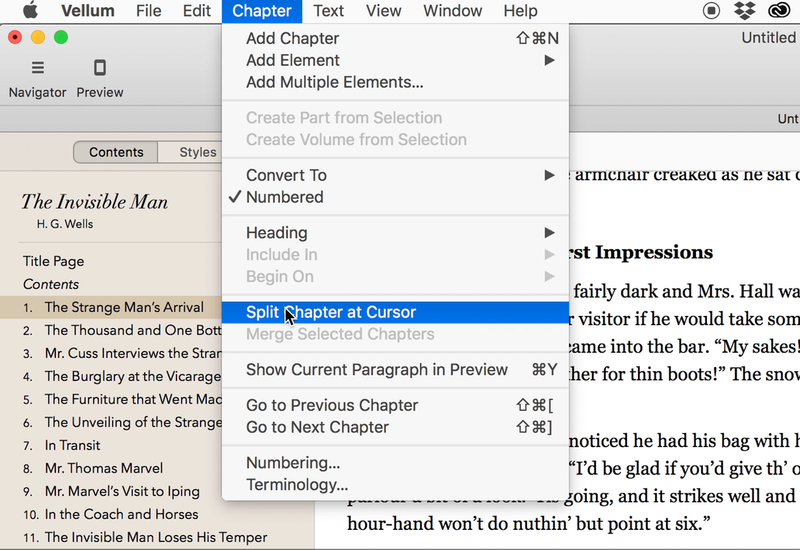 After import, if you find Untitled elements mixed in with your chapters, then it is likely that Vellum split one of your chapters into multiple elements. This can happen, for instance, if your manuscript contains too many empty lines in a row. You can correct this by merging these elements. Click on the first element to be merged, then hold down Shift and click on the last one. Then use Chapter ▸ Merge Selected Chapters to combine your selected elements into one element. If Vellum fails to detect the beginning of a new chapter in your manuscript, you can extract it using Vellum’s split feature. First, locate where the new chapter should begin. In the movie below, for instance, the text for the second chapter, Mr. Teddy Henfrey’s First Impressions, appears at the end of the first chapter. To fix, place your cursor where you want Vellum to perform the split. Choosing Chapter ▸ Split Chapter at Cursor will remove all of the text after your cursor and add it to a new chapter. Once you’ve successfully split your chapter, remember to set the title of the new chapter, if desired. 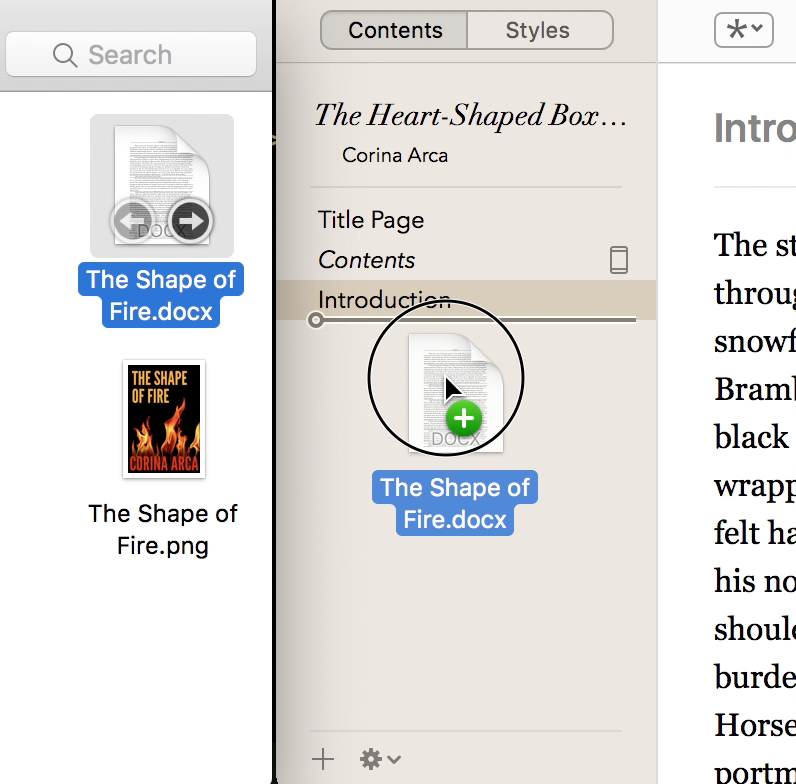 If you’d like to import into an existing book, you can do so by dragging any .docx file from the Finder and dropping it into Vellum’s Navigator. Importing this way can be very useful when creating a box set, for example. 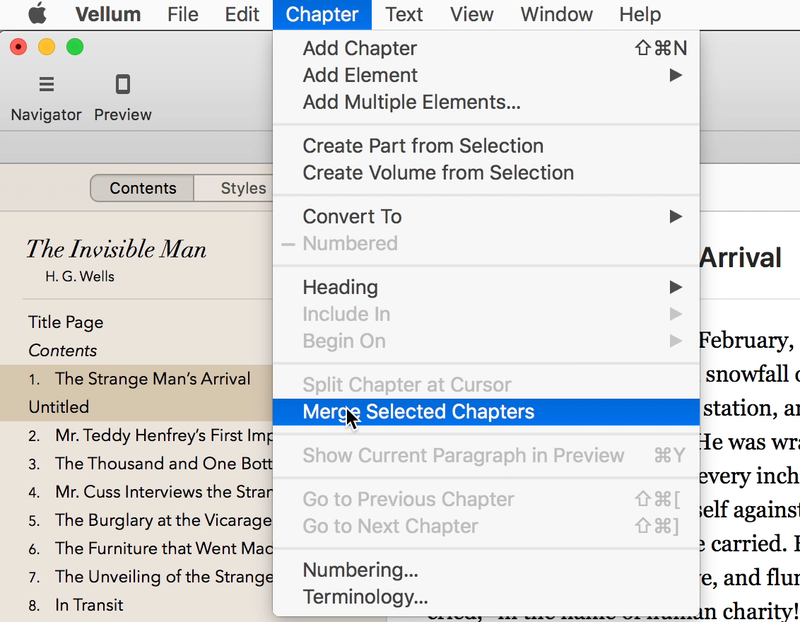 If you prefer to maintain separate Word files for each chapter, then you can drag their containing folder to the Navigator as well, and Vellum will import each one. Vellum will use the names of each file (e.g. Chapter 4.docx, Chapter 5.docx) to determine the order of the chapters. You can also drag Vellum documents and drop them onto the Navigator. 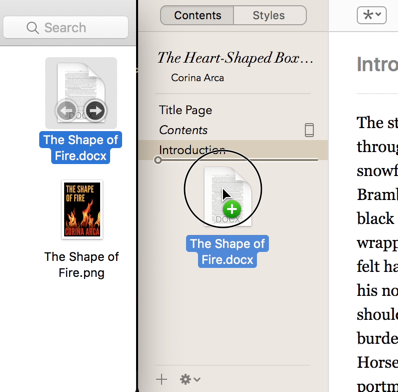 Vellum will create a Volume at the drop location, and import the contents of your book into it. 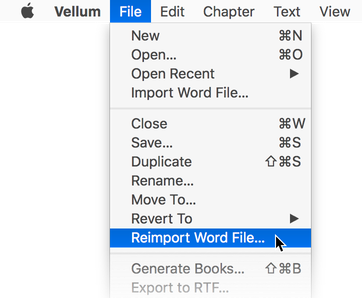 Should you make changes in your manuscript, you can reimport from the original file using File ▸ Reimport Word File…. This will import your updated manuscript and replace the content that was previously imported. Front or back matter that you’ve added in Vellum will remain in place. When you feel comfortable with reimport, you can hold down the option key to show the Reimport Immediately menu item instead. Selecting this item allows you to skip the confirmation step. You should find the Advanced Import Documents in your Downloads folder.